For this article, I researched Law of Attraction quotes that contain nudges of wisdom that reveal key Law of Attraction techniques and teachings. These Law of Attraction quotes come from a variety of famous and influential historic figures that lived in the 19th century or before, throughout our written history. Let us learn from them. Lao Tzu, Buddha, Khrishna, Solomon, Gandhi, Marcus Aurelius, Sallust, Virgil, William James, Henry David Thoreau, Soren Kierkegaard and Benjamin Disraeli. 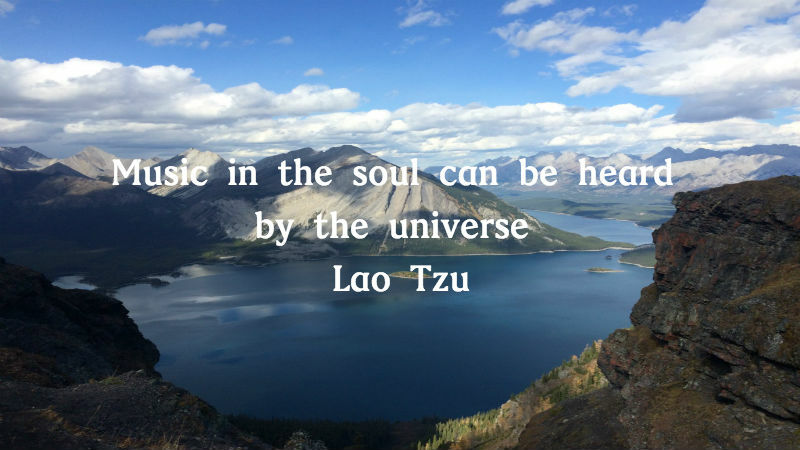 The meaning of this Law of Attraction quote by Lao Tzu is that our vibrational frequency is generated by our soul and emanates out to the universe. The universe hears our vibrational frequency and returns to us opportunities and situations that match our frequency. This is a foundational principle of the Law of Attraction and Manifestation techniques, elegantly stated by this famous ancient Chinese philosopher. Pay attention to the music you are sending out to the Universe. It is the music of your soul that creates your physical reality. In this Law of Attraction quote, Lao Tzu is teaching us about infinite flow of Abundance; which is a cornerstone of the Law of Attraction. Lao Tzu is telling us that the wise man and the sage open the valve of abundance by giving. The more he opens the valve the higher the flow. The more he gives, the more he receives. The flow of Abundance is continuous and infinite. Hoarding and competing are clear signs of believing in lack, which is very prevalent in present social consciousness. We, as members of today society, have a long way to go to become wise men and women. Let us learn from the sages; we shall allow the flow of abundance. It is time to let go of competition. We shall embrace the belief and knowing of infinite flow of Abundance. Let us send out to the Universe, our song of Abundance. It is time to allow the Universe send us back riches beyond our wildest dreams. 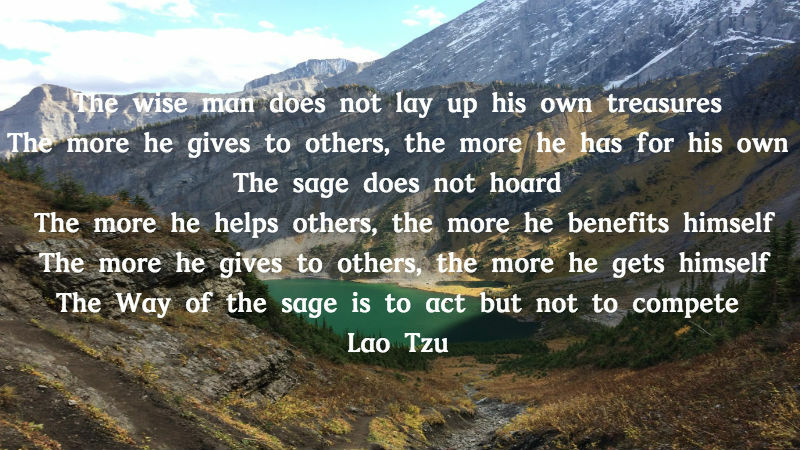 Lao Tzu is teaching in this Law of Attraction quote about giving and receiving abundantly, he is teaching about not hoarding and win-win collaborations. You might be asking: How do I open the flow of abundance? How do I translate this Law of Attraction quote into a practical LOA technique? The answer is to consistently practice giving without attachment or expectations of being reciprocated. This Law of Attraction technique consist in practicing giving and gifting from a place of feeling abundant. Practice giving just for the joy of giving and the feeling of being abundant. Be wary of giving from any heavy feeling energy or low frequency emotion. Do not give from a place of obligation or requirement or fear. Do not give or gift from a place of feeling in lack. Each time you give time or money or kindness or any other gift, – pause and drop into your heart to feel gratitude for the resources, talents and gifts you have. Savour the feeling of abundance. The following four (4) Law of Attraction quotes speak to the Power of your Thoughts in manifesting your physical reality. The quality of your thoughts determine what you attract in all areas of your life. The process of manifesting love, manifesting money and manifesting health starts with your thoughts. Therefore Self-awareness of your thoughts by paying attention is a key Law of Attraction technique. 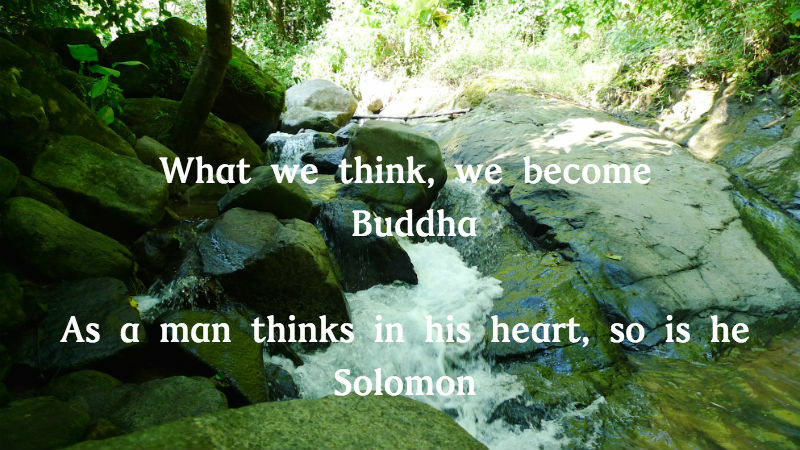 The meaning of these Law of Attraction quotes of Buddha and Solomon is that our vibrational frequency generated in our heart is what we are and what we become. Our vibrational frequency is a function of the thoughts we accept through our minds and then process with our heart. 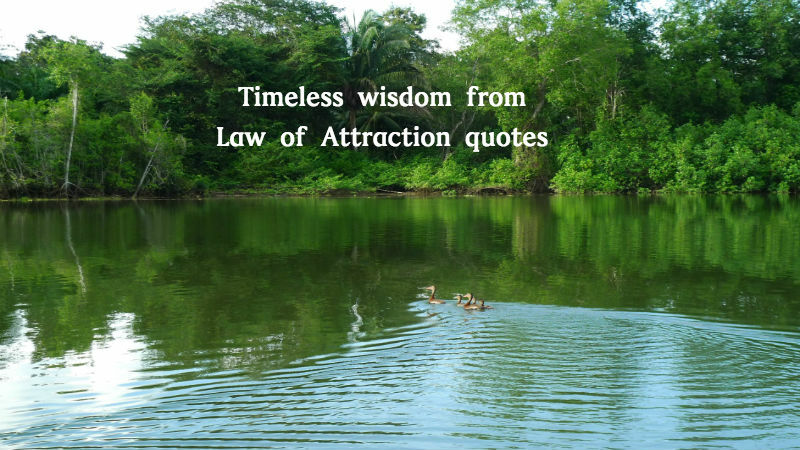 Since our vibrational frequency creates our reality, the teachings contained in these 2 Law of Attraction quotes of these giants of our history are directly related to LOA. Be aware of your thoughts and choose thoughts that are aligned with vibrations of kindness, generosity, collaboration, love, enthusiasm, optimism, contentment. Then you will attract people that match what you are being. It is the key of attracting the quality of relationships that you desire. How amazing that these 2 Law of Attraction quotes from such different times of our history, are so similar! Marcus Aurelius was emperor of Rome in the 1st century. Soren Kierkegaard was a philosopher and theologian in the 19th century, born in Denmark. The meaning of these Law of Attraction quotes is empowering. They remind us that we are manifesting everything in our lives: physical health, quality of our relationships, our physical surroundings, our finances etc. We are expressing our life through the thoughts that we accept. We are empowered, when we become aware of our thoughts and consciously choose thoughts that are aligned with the life we desire to attract. The translation of the above 4 Law of Attraction quotes translate into the following LOA technique: Be aware of your thoughts. You might be asking: How can I become aware of my thoughts? Question your thoughts. Ask yourself: Is this thought benefit it me? Is this thought congruent with the life I desire to attract? Challenge yourself frequently to choose a higher vibrational frequency thought. In other words to choose a happier thought that is congruent with the life that you desire. 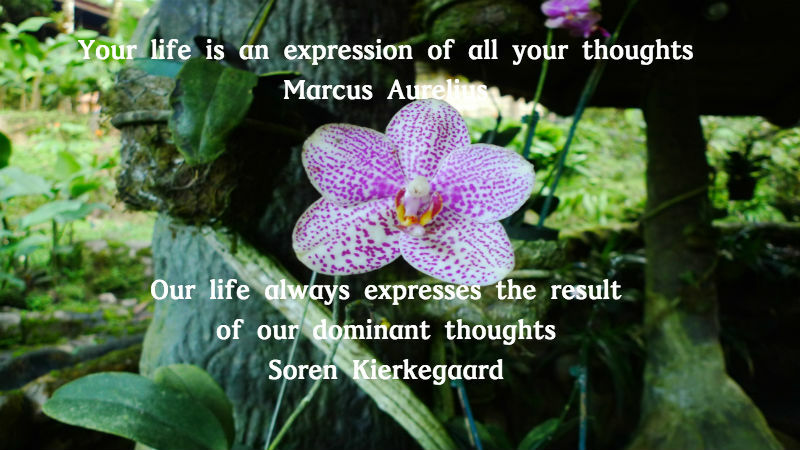 S. Kierkegaard, in this Law of Attraction quote, is remind you that: Your life is a manifestation of your dominant thoughts. Therefore choose thoughts that are congruent with the life you desire to manifest. Choose thoughts that are congruent with love, joy, peace and abundance. It sounds simple but is not easy because of our sabotaging subconscious imprints of fears and worries. Is your mind running in auto-pilot with thoughts contaminated with fears and worries? or Is your mind processing pure thoughts of high frequency? Would you like to learn to masterfully process pure thoughts? How to get past the sabotaging subconscious imprints of fears and worries? How to sustain the turbocharge of pure thought? Unique guidance on how to fine tune your message to the Universe? Powerful practices for manifestation and much, much more. The following 4 Law of Attraction quotes speak to the fact that your thoughts and believes shape your life. Therefore Law of Attraction techniques or practices aimed at Upgrading your beliefs and thoughts are key for manifesting your goals in life. Lord Krishna, an ancient avatar from India, teaches us that we are what we believe. 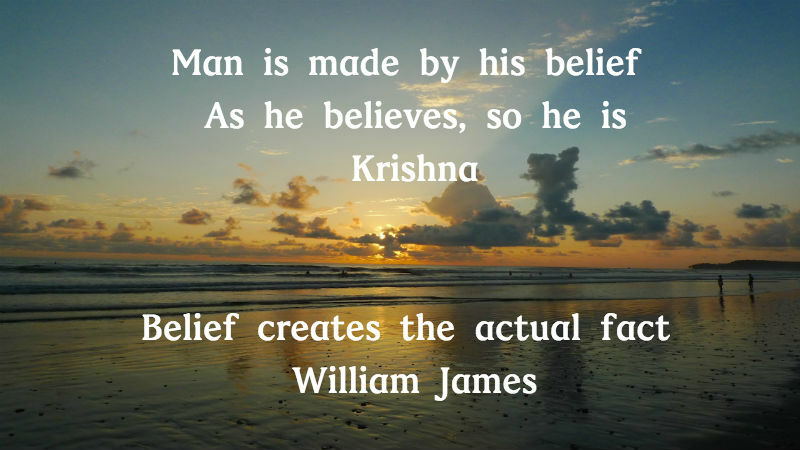 William James, a 19th century philosopher and psychologist, states that our beliefs create our physical manifestations (actual fact). Lord Krishna, more than 5000 years ago, was already teaching humanity about this Law of Attraction fundamental. What does it mean, that we are made by our beliefs? It means that our vibrational frequency that emanates out, through our bodies and auras, is what we are. Furthermore, our vibrational frequency is a function of our beliefs. Therefore, we are what we believe. Then our vibrational frequency is broadcasted out to the Universe and we attract to us physical manifestations that are aligned with the frequency of our broadcast. In other words, what we create/manifest is influenced by of our beliefs. From the above 2 Law of Attraction quotes, we can understand why all teachings about the Law of Attraction are talking about upgrading our beliefs (conscious and subconscious programs). You can start by paying attention and questioning your present limiting beliefs. Once you identify a limiting belief, reach out in the space of acceptance of your own mind for a higher-level truth. These 2 Law of Attraction quotes are clear statements about the Power of Beliefs and thoughts. Virgil, ancient roman poet, states in this Law of Attraction quote that there is no limitation to our capabilities. The only limitation is what we accept to be true about our capabilities. 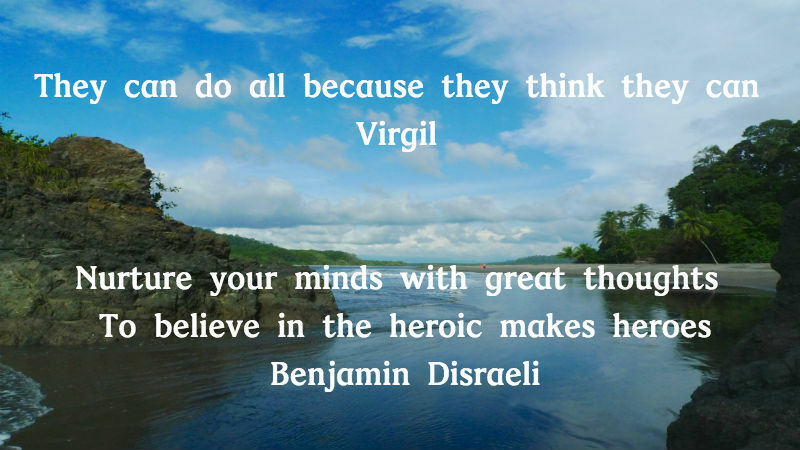 In other words, Virgil is saying; if we think we can then we do. Since our beliefs dictate the thoughts that we accept as truth, the complete sequence is: If we belief we can, then we think we can and therefore we do. Benjamin Disraeli, one of the British Prime Ministers in the 19th century, also speaks in his quote about the Power of Belief on what we are capable to do. If we belief we are capable of heroic acts, then we do and we become heroes. The first phrase of his Law of Attraction quote, speaks to the importance of self-awareness of the thoughts we are accepting. He speaks of the importance of feeding our minds with great thoughts. Question your present core beliefs about your capabilities. Stretch and expand the boundaries of what you believe, you can. Challenge your thoughts and beliefs of “I can’t”. To manifest your desires, you need to start by believing that you are capable of doing so. Pay attention to your thoughts, this will facilitate you to identify your beliefs. When you are not paying attention, your thoughts are going on automatically and are based on your subconscious beliefs. When you pay attention, you can start choosing “great thoughts”. Repeatedly and deliberately choose great thoughts. Be vigilant of the quality of information (thoughts) you feed your mind. Do you watch, read, listen to scarcity and/or fear-based information? Remember to nurture your mind with thoughts that match the quality and frequency of the life you desire. Sallust, Roman historian of the 1st century BC, is stating a primary principle of the Law of Attraction. Each human being is designing (architecting) his own life. 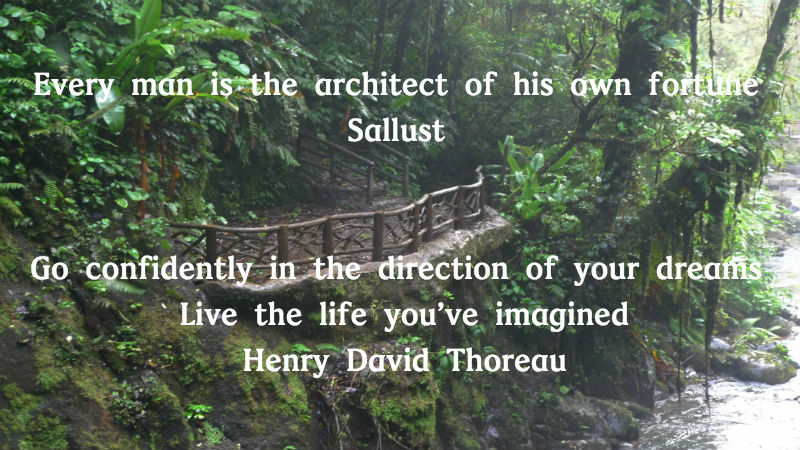 Henry David Thoreau, poet, philosopher, historian of the 19th century, is revealing in this LOA quote is revealing a Law of Attraction technique: Use your Imagination to manifest your dreams and follow the bliss of your dreams. As we can see, from Sallust Law of Attraction quote, more than two thousands years ago, there was awareness about the LOA. There was awareness about how this physical dimension works. There was awareness about the fact that each human being is creating his own physical reality. However, based in our history, we can see that this awareness was only present for a minority of people. Nowadays, the awareness, understanding and conscious application of the Law of Attraction techniques has grown. This is encouraging because being a deliberate conscious creator is directly related to reaching higher levels of consciousness. You might be asking, if each of us are creating our own reality. Why are we creating suffering and lack? Nobody wants suffering and lack. The reason is that many of us are creating our own realities automatically and subconsciously. This means we do not pay attention and we are not aware of our thoughts, beliefs and emotions. We are operating in automatic with the limiting beliefs of our subconscious programs that we acquired through our genes and environment. We accept suffering, lack and limitations without realizing. It is time to increase our self-awareness. Let us take command of our ship. Let us recognize and embrace the unlimited abundance of the Universe that we are. It is time to remember and embrace our own unlimited creative power, as an individualized expression of Source. The challenge is that, we have shackled ourselves with so many limitations and fears. Therefore it takes willingness, determination and focus to free ourselves and regain our power of consciously architecting our life. Are you ready to take the journey of being a conscious architect of your own fortune? Henry David Thoreau offers us through his Law of Attraction quote, 2 suggestions: Following our dreams and using imagination. Let us elaborate on this, by starting defining dreams. What are dreams? In the context of H. D. Thoreau LOA quote, dreams are the desires of our heart. In this context, following our dreams is equivalent to following our bliss. These are desires of our heart (soul) that lights us up. When we imagine ourselves living our dreams, it feels expansive, joyful, peaceful or any combination of high frequency emotions. In few words, it feels great. H. D. Thoreau LOA quote states the powerful Law of Attraction technique of using your imagination to visualize your dreams. Then take action in the direction of these dreams. The Universe will be presenting you with opportunities to take action in the direction of your desires. Mahatma Gandhi is certainly an amazing model of inspiration of what is possible. So often, we get so discourage of the affairs that are on going in our planet. Sometimes, when we watch the news, our optimism for our future as humanity diminishes. Sometimes, we allow ourselves to be swept into the social consciousness of anger, blame and fear. On such occasions, we are forgetting our own Power. We are forgetting that the change start within each of us. We are forgetting about the Power of our Love. Gandhi is this famous Law of Attraction quote is teaching us to embody the vibrational frequency that we wish the planet to reach. In other words, he is teaching us to emanate from our heart love, peace, joy, kindness and harmony. As we do that, we contribute to raise the consciousness of humanity. As we do that, we inspire others to embrace and embody higher frequencies. Gandhi is a great example of inspiring others to be and to act peacefully, regardless of the external circumstances. As we, consistently, generate high frequencies and visualize a heaven on earth, a threshold will be reached whereby the changes that we wish to see on this planet will materialize. Law of Attraction technique in action, at its best! 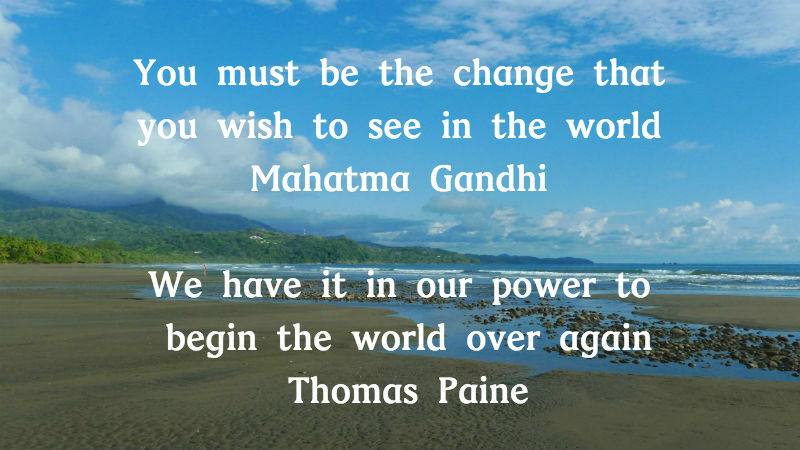 Thomas Paine, 18th century writer, also refers in his Law of Attraction quote to our inner Power to create a new world. Both Gandhi and T. Paine, in these Law of Attraction quotes, are remind us that the change starts with each of us. We have the Power and Freedom to raise our frequency, and consequently raise the frequency of the planet. Do not underestimate the Power of your heart. Stop feeding your mind with fear and/or scarcity information. Instead choose thoughts of abundance, gratitude, peace and love. Practice visualizing heaven on earth and feel the joy in your heart. Be aware that what you focus on, persist. Therefore, stop feeding energy (your attention) to low consciousness events. Stop adding fuel to the fire that you do not wish to be prolonged. Stay centered in your vision of love, joy, peace and harmony for humanity. Choose your thoughts independent of outside events. Focus on the abundance that you already have. The basis of the Law of Attraction is that the Universe returns to us physical manifestations of the frequencies that we are emanating. The challenge lies in our tendency to choose our thoughts and emotions based on what our senses are picking up from our exterior world. Therefore, it is a self-perpetuating loop, unless we take conscious command of our inner world. 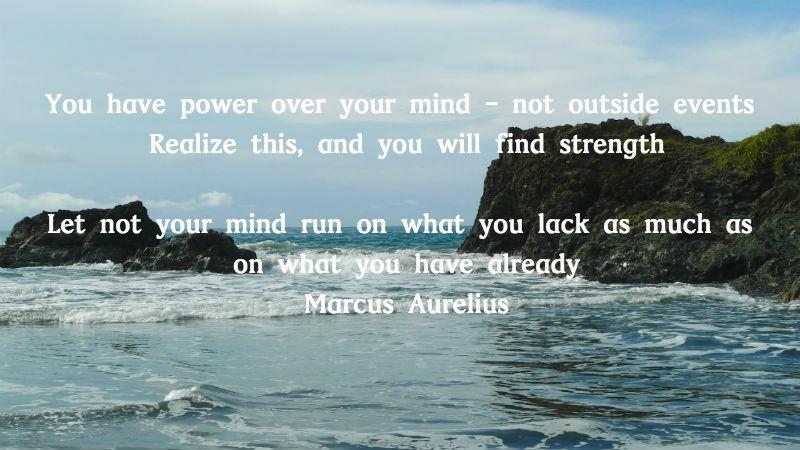 We have power over our mind, as stated by M. Aurelius LOA quote. We need to change our inner frequency, if we wish to change our external physical reality. How can I interpret this event from a higher frequency emotional perspective? What wisdom can I gain from this event or experience? How can I be in understanding and compassion toward myself and others in regards to this event? What thoughts can I choose that would elicit a more pleasant feeling emotion? To attract abundance, we need to emanate the frequency of abundance. In other words, we need to feel abundant. To do that, we need to focus on what we already have. Let us direct our mind to run on what we already have. When you purchase any item feel abundant. Find as many creative ways as you can to feel abundant and blessed for what you already have. H. D. Thoreau Law of Attraction quote speaks to the power of imagination. It also speaks to the holographic nature of physical reality. Our physical world is created and re-created in every moment of Now by the vibrational frequency that we are generating and sending out. We are projecting on a blank canvas the frequencies of our creation. We are continuously manifesting effortlessly and automatically. The default mode is just staying in the same or very similar range of frequencies. For that reason, our lives do not change much. When we wish to change our lives, we need to generate the frequency of the new life that we desire. Imagination is the bridging mechanism to go from one reality to another. Imagination is visualizing and experiencing (feeling) in your eyes mind, a new reality. It is the basis of the visualization techniques of Law of Attraction teachings. 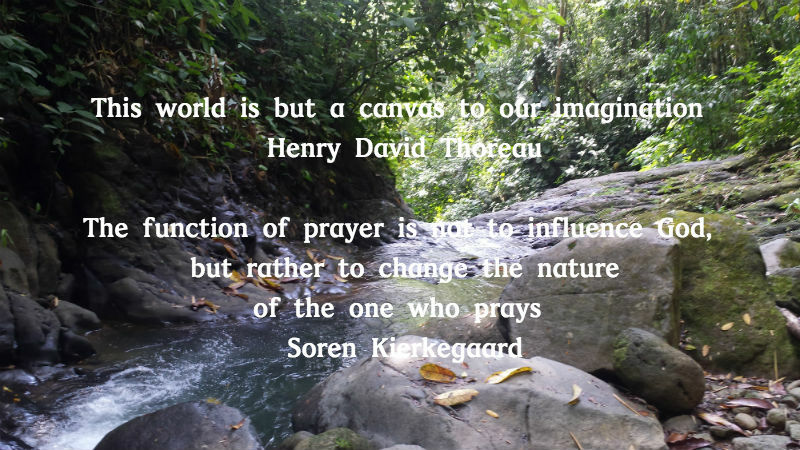 S. Kierkegaard is addressing in his Law of Attraction quote the power of Prayer. How does prayer work to change the nature of the one who prays? God/Universe is completely neutral and non-judgmental. Universe returns to us physical demonstrations that match our vibrational frequency. Therefore, the power of prays lies in helping us to raise our vibrational frequency. For each of the above Law of Attraction quotes, I offered, from my perspective, a description of how these quotes relate to the LOA, as well as, the teachings, wisdom and LOA techniques they reveal. Ask yourself: Which of the above Law of Attraction techniques or teachings can I implement? What is the quality of my dominant thoughts? What are the next level up quality of thoughts that I can accept? How does heaven on earth look like and feel like to me? How does my dream life look like and feel like? Make it a daily practice to imagine and visualize your dream life and your dream planet. During the visualization FEEL high frequency emotions such as peace, joy, bliss, love, enthusiasm, gratitude, contentment etc. Thank you for your contribution on the creation of heaven on earth. I would love to read your comments and perspectives about these Famous Law of Attraction quotes.